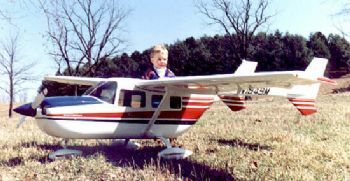 26% Cessna Skymaster Span: 119" Length: 92.8" Area: 1947 sq. in. Weight: 32-40 lbs Engines: Minimum 1.8 cu. in. each engine. The Parts Set includes all cut parts including fuselage side, booms and boom formers.